Maria Adams, Jim Brosnan, Charlie Castronovo, Melissa Cole, Jane Daniels, Mark Kotkin, Walter Plankl, Dianne Press, Anwer Qureishi, John Robinson, and Brian Strasavich. Minutes of January 14, 2015 meeting were accepted. Volunteer Service Agreements: Everyone present signed the agreements as required by State Parks. After Brian signed them, he gave everyone a copy of the agreement that they had signed. Financial – Jim Brosnan reported a bank balance at the end of 2014 of $1,771.48 and later reported a balance at the end of January, 2015 of $2,139.78. In 2014 we spent money on three categories, i.e. insurance, Street Fair, and website, some miscellaneous/flexible expenses such as $200 in application fees for the bridge grant. We should remember that some companies, such as IBM and GE, have a matching grant program for current and retired employees. 2015 Budget approved. Anwer will order the new rack card boxes. Snowmobilers should check into the office before heading out. Ice fishing is open. Teatown Lake Reservation is conducting a fisher survey, by setting bait near a camera. ishers are a member of the weasel family. The bath house road will be closed for 48 hours. They will excavate, take down trees and put in a sand filter for storm water drainage. The Park is advertising for life guards and seasonal employees. Anwer will post that on our website and on Facebook. Brian will reach out to Con-Ed to see if they can help to get the telephone poles to the prospective bridge sites. The park has its own trailer if necessary. The Taconic Road Runners will donate a replacement for the mantelpiece around the fireplace in Pavilion I, together with a plaque. Dianne is afraid that this will take away from the authenticity and historic value of the architecture. Fishing Line Disposal: Jane asked Walter to see if he could finish the project once spring arrived. He saw in Florida how to do it. 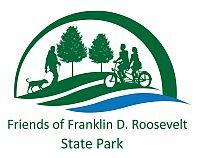 Parks and Trails New York Grant: A final report is due February 16 and Jane has asked for an extension because we have not used all the money in the grant. Recreational Trails Grant: Jane reportedthat as a recipient of a Federal grant, there are a number of “hoops” we have to jump through to finally receive the money. The documents required will make FoFDR a stronger organization even though we are small. Because of our small size we do not have to have a security policy or a disaster policy. These required documents have to be approved by the Friends. Jane thanked Maria for providing background information and helping to proof read the documents. A resolution accepting the grant - Melissa Cole made the motion to accept, John Robinson seconded and it passed unanimously. Anwer, as secretary of the board, signed the resolution to be mailed to the grant administrator, Erin O’Neil. Anti-Nepotism Policy – Jane explained that this policy, although not required, is a good one to have. It is a separate policy from the By-laws. In particular, it acknowledges the legal definition of “close family”. Thus family members may not serve on the board. John Robinson made the motion to accept, Mark Kotkin seconded and it passed unanimously. Volunteer and Director Evaluation – Jane explained that even though we have no staff, we are required to have the forms available to evaluate our volunteers and directors. Anwer made the motion to accept, Dianne seconded and it passed unanimously. Mark asked where these documents are stored. Jane said they would not reside in someone’s home in a file box, but on our website. The By-laws are supposed to be public. Jane will keep hard copies. Jim wanted to know when we could start work on the bridges. Until the Federal government tells us “yes”, we can’t start or any money spent will not be reimbursed. Jane does not know when we will be given the ok to start. Our Bylaws, passed in 2013, are not compliant with the section of the non-profit law that took effect in July 2014. Jane asked a friend, Chris Connolly, a lawyer and familiar with the latest changes, to review the Bylaws and suggest modifications. Maria’s proof reading resulted in minor corrections, such as spelling. The question was raised if FoFDR could have our picnic as the Annual Meeting. We could, but the Bylaws would need to be changed. Section 2.8 Vacancies - Deleted first sentence and changed the second sentence (The President may appoint a Director to fill an officer vacancy until such time as the board can take action on the vacancy.) to The President may appoint a Director to fill an officer or director vacancy until the next Annual Meeting. Section 2.10 Conflict of Interest - added and nominated board member…. Before the annual elections are held. Section 3.2 Special Meetings - Deleted the second paragraph because filling vacancies has been changed. Section 4.1 Voting - Jane noted that under NY State Law, proxy voting is permitted, but we have to state that we allow it and we do not. Section 4.2 Quorum - Deleted special meeting and 20 members entitled to vote. Note: state law says a minimum of 10%. Section 5.1 Standing Committee – Deleted the word “Standing” in the heading and in the third paragraph. Added to the third paragraph Such committees can be established indefinitely or for a specific purpose with a time frame. Section 6.3 Books and Records – Changed The Treasurer shall be responsible for maintaining adequate financial records, prepare a financial report for each scheduled Board meeting, and collect all fees to be deposited in the name of the FoFDR, in a reliable bank selected by the Board to be The Treasurer shall be responsible for maintaining adequate financial records, preparing a financial report for each scheduled Board meeting, and coordinating with the President in collecting all fees to be deposited in the name of the FoFDR, in a reliable bank selected by the Board. Section 6.4 Use of Funds and Dissolution – second paragraph changed “Articles” to Certificate. Third paragraph added section before 501. John Robinson made the motion to accept the changes to the Bylaws, Melissa Cole seconded and it passed unanimously. Election of the Board: John Robinson, Walter Plankl, and Maria Adams agreed to serve as the Nominating Committee. They nominated Dianne Press, Melissa Cole, Charlie Castronovo, Jane Daniels, Anwer Qureishi, and Jim Brosnan who have accepted nomination to serve on the Board at the upcoming election at the Annual Meeting in March. Melissa offered to serve as membership chairman. Melissa stated that we currently have 180 people listed on our e-mail list. Charlie asked if we needed to update our insurance policy. Jane will contact our insurance agent and will give them the names of the new Board Members. I Love My Park Day is Saturday, May 2. Jane suggested that Brian contact Volunteer New York about the church group that was to do vine cutting on the King Day of Service and was canceled. We should invite them to I Love My Park Day. Other groups to be invited include Hudson Valley Geocachers and the local Boy Scout and Girl Scout community leaders. Melissa will forward contact information to Anwer who can add them to our publicity contact list. Anwer will participate in a webinar with NY Park and Trails New York about “I Love My Park Day”. Jane also mentioned that there will be a National Trails Day event in the summer. It may be nice to participate.